Is our only source of comfort our stocks and money? Where do we get our comfort? The Almighty Dollar right? I’ll keep praying to my money. I know that the dollar can hear me. I just know it. Let’s all go down to our local bank and set up a little praying booth and we’ll be heard. We must! A veteran Hong Kong stock commentator burst into tears during a live television broadcast as she saw HSBC’s shares plunge dramatically seconds before the end of Monday’s trading. Let’s all have our “19th nervous breakdown”. I caught this guy on tape around 2001. You know what? We all have bad days. We’re never alone. A lot of stuff is going on right now that is more than mind-boggling. There are a lot of folks out there that have been negligent, ignorant, selfish and greedy. This I believe is why all this bailout, stimulus package has come about. Do you think that throwing money at these people will help? No! Because it is an internal problem of the mind. It is bad habits and total disregard for doing the right thing. Yeah, in the old days people worked hard to get somethere. There are a lot of Americans still today that do work hard to get somewhere. My Great Great Grandfather immigrated from France in 1846 to Ohio. He didn’t know English. He learned it and struggled his way to become a country doctor in New Bedford, Ohio. He struggled through hard winters and cared after people with pneumonia and other diseases of the day. There were no cars and he went around by horseback making calls on patients and would be gone from home days at a time. THIS IS AMERICA! Many people have the “lottery” mentality wishing for everything under the sun to come there way without any lifting of fingers. It is sickening. I believe America will fight the good fight. There is something higher at play, here. Will we exist as a nation of hard workers or a nation of “lottery” lovers. The time is now to wake up and not settle for the mediocre, “I can’t” mentality. Get up, stand up, rise up! For God, For Country, For Honor! Whose in charge here? We have forgotten what the country was made of. Overseas we get trashed for how America is now. They expect us to lead! How can we lead if we can’t even see through the confusion and chaos? I lived overseas for two and a half years and I was confronted on few occasions about American Politics. Let’s put it aside and go back to our roots. It’s burning within each of us. And by the way, Mr. Attorney General, Americans are not cowards. Shame on you! They stand for what is right. The creative pursuit is one of the most important things one can do. Sometimes the creative types are a bit fiery and extreme in their thinking. But, isn’t this good though? Creative types bring the passion into society and really are the catalyst to make things happen. See the clouds and colours all around. See the birds and stars tonight. Going with the rising tide. Shouldn’t wait till morning time. Moments pass as I decide. I tell myself the reason why. Waters flow and there’s no turning back. Where it ends has only just begun. Ray of light about to shine. We shall see how things progress from here. The world needs freethinkers and people with passion to guide the way. No need to dumb things down anymore. As the New Hampshire motto says, “Live Free or Die.” America really is at a crossroads. It is time for decisions. up1Wikipedia contributors. Psychedelic music. Wikipedia, The Free Encyclopedia. May 21 2008, at 23:57. Available at: http://en.wikipedia.org/wiki/Psychedelic_music. Accessed May 22, 2004. World War II? McCain was born in 1936. He would have been three years old when the war started and nine years old in 1945 when it ended. Why is he talking about that? This is strange. 4390 divided by 5 (years since 2003) = 878 casualties per year. What’s the Deal? You’re not an Iraq War Fan? A month back maybe, I was eating at a little restaurant outside and a late 50s overweight man kept saying Amerikanetz (American in Bulgarian) and pointing and carrying on. After much uproar, he finally came over and just sat with me and was drinking Rakia and he bought me a beer. He seemed a bit angry and cursing under his breathe. I had heard the words before by kids at the Black Sea. I sat there and gave the guy the benefit of the doubt. Eventually, he got on the subject of Iraq. And in my broken Bulgarian I tried to say that I wanted peace and didn’t like conflicts and that I was there in Bulgaria and not Iraq. And that yes America does have problems. It was a strange encounter. He kept toasting me but it felt like he didn’t like me or Americans. He kept saying this word that sounded like “Боклук”. I was quite curious so I took out my dictionary and searched for a word sounding like “Боклук” but I couldn’t find it. To ease his mind, I started to talk about the Beatles and Bob Dylan and how they were very much for peace back in the day. We left the restaurant and as we were walking he said that his life was the Beatles. As we walked through the streets it felt like I was in a parade and the object of attention. The man asked old babas (grandmas) sitting on outside benches, “Do you know the Beatles and Bob Dylan?” And he said this guy is American. I heard the old ladies say “Beatles” and “Bob Dylan.” Very weird. So I texted a Bulgarian and Боклук means “trash” or “garbage.” So I think that I will avoid this guy if I see him again. I don’t know if he was calling me trash or America or what. He did say Hitler at one point. Doesn’t seem like a pleasant kinda guy. But anyway, “What’s his deal?” I’m like the most peaceful non threatening guy around. It is interesting that this guy said his life was the Beatles. I can only hope that others would follow suit. There is too much chalga influence here and not enough influence with substance. 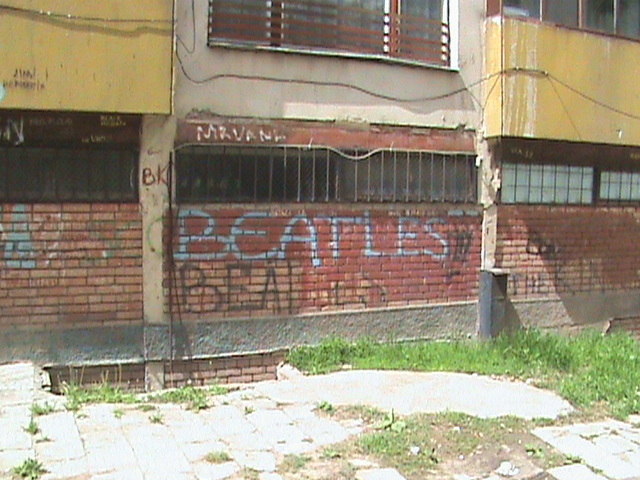 I did find that there are a few Beatles fans here.